Ok, this is small and a bit crazy. It measures 16" tall and just under 19" wide. I had been working on log cabin blocks and needed real small scraps. So, I saved bits less then 1" squares in a tin, nicknamed the Little Tin of Horrors. I got the log cabin blocks done and thought I might light the tin of scraps on fire. But then I though maybe I could sew some together. Oh yes very crazy. Well, I kept sewing. Now I have a piece of fabric. Not sure what I will finish it into. Maybe a bag. So no more Little Tin of Horrors. And no more saving tiny bits there has to be a limit. I will keep 2" squares or any log over 1 1/2". Here is some of the log cabin blocks. Very small bits used to make the blocks. So pretty, Cathy. I think your made fabric would be a pretty center for a quilt with other blocks around... like flying geese or windmills. Could be a baby quilt. Love your blog. 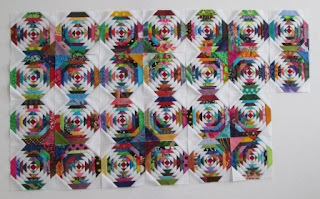 There are always great colored quilts. Thanks, What ever I do with it, I know it is not done yet. A center for a scrap quilt might be great. I have lots of scrappy blocks that could be added around it. I did not use any Y seams. I did not have to trim much. I think I just had bad seam allowances some bigger then 1/4". It is a heavy bit of fabric. I am going to try not to save those tiny bits any more. Crumbs do seem to breed over night. I did use the whole tin of bits so that tin of scraps can not breed anymore. I am sure more will some were in my sewing room. thanks for stopping by. I love those crazy scraps! a place-mat possibly? I could get down with a set of those on my table!